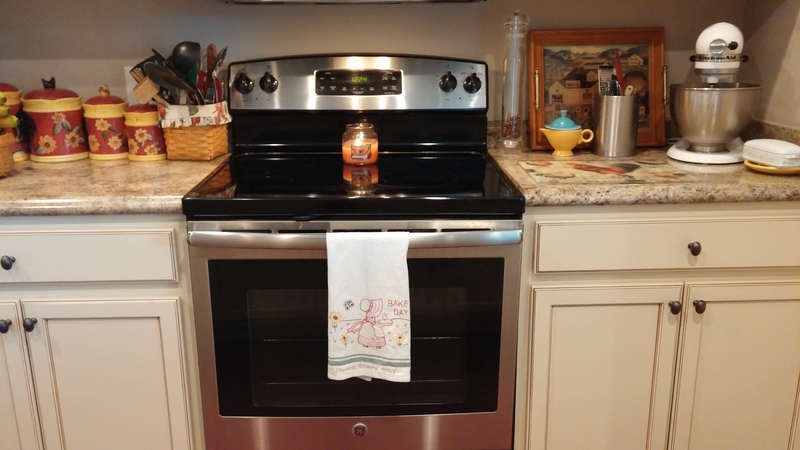 See that pretty embroidered kitchen towel hanging on my oven door? It was hand stitched by a friend. When it was given, she let me know that it was full of mistakes – little “imperfect stitches.” Really? I look at it and I see the big picture – a sweet little girl, adorned with a bonnet and apron, delivering a cherry pie on Baking Day! I also see the heart of the stitcher, if you will. She spent her time and effort making that for me! I love it and I dare anyone to wipe their dirty hands on it – I have store bought towels for that purpose! This is my treasure, set aside for my enjoyment – imperfections and all. Those are all quotes I’ve recently heard women say concerning their relationship with God. They’re basing those statements on what is or isn’t happening in their life. Something they’ve prayed about hasn’t been answered, some desire they’ve asked God for hasn’t been given, and so they turn their focus from looking heavenward in prayer to looking inward at themselves. They start searching for all the imperfections, and oh, there are many in all of us – it’s called an old sin nature, and we deal with it every single day. But wait a minute, that’s what Jesus came to take care of on the cross! That sin has been paid for! It’s covered by the blood! Because I’ve received Christ as my Savior, when God looks at me, He sees me as having never sinned, based on the finished work at Calvary. He sees “the big picture” which is my justification through Christ. I don’t have to worry that He’ll see my mess ups and times when I sin (and there are plenty), because He sees me through His perfect Son. My friend might have wanted to point out and fix the imperfections in the towel she made for me, but it did’t matter to me. We might try to “fix” up so we’re good enough to please God, but you can’t get any better than Jesus! He “fixed it” all for eternity. You are absolutely right that people struggle with the thought “am I good enough”. What are we…the church…doing to come alongside each other and point to Christ? It’s not enough to say the talk but are we as Christians willing to have dinner with the tax collectors and others deemed “not good enough”? As a community of Jesus followers we are to link arms and leverage our gifts for His glory. We as women are so prone to compare ourselves and that does lead to feeling inadequate. What are we as sisters in Christ doing to encourage one another? Are we propping ourselves up on others’ failures or are we coming alongside each other, linking arms, and leveraging each circumstance for God’s glory?? We as women are so prone to compare ourselves and that leads to feeling inadequate. But as sisters in Christ we need to stop comparing ourselves. 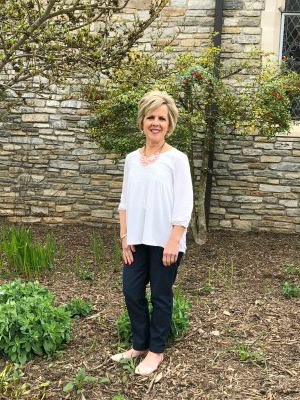 If a sister stumbles or even falls of the cliff so to speak…instead of judging her or withholding favor, we should link arms and leverage the experience for God’s glory. I love that pretty towel and as a stitcher I know the love that went into making it for you! All stitchers who give a hand made piece treasure the one they took the time to make the gift for!! I read that the Amish ladies always make one mistake in their quilts to remind themselves that only God is perfect!! ( I really think of that when I make a mistake in a piece and it helps me to get over it! ):) No, none of us are ever going to be “good enough’ but I am so thankful I had a Savior who was perfect! It pays to look back over one’s inbox! I had somehow missed this when you first posted it. But how very, very good it is. And yes, only God is perfect. That thought helps me so much when I feel there are a lot of flaws or mistakes in things I’ve made. Doing something as to the Lord with the right heart attitude is a lot more important than having it be technically perfect. 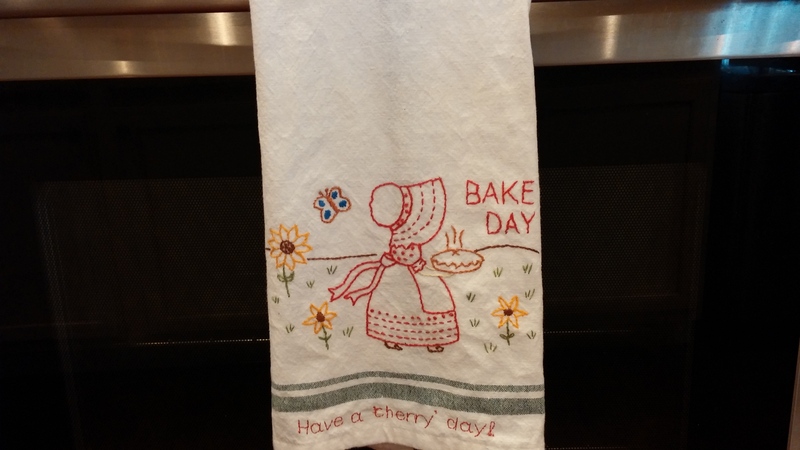 And the embroidered kitchen towel … simply beautiful. I don’t see any mistakes at all, just creativity and love.